Today I welcome , Laurel Regan who I connected with over two years ago and have been in touch since. Her writing, her photography, her various art and craft projects – are all testament to Laurel’s creativity, which I admire very much. I’m also glad to be part of The Artist’s Way Facebook Group Laurel has created. Laurel lives in Ontario, Canada and blogs at Alphabet Salad. You can also find her on Facebook and Twitter. We live in a world where the pursuit of more, different, and better has become a number one priority. It’s all too easy to get caught up in that mindset, lose focus, and quickly become dissatisfied with our lot in life. I’ve certainly been there and done that… but I am also learning that practicing gratitude is the first step toward restoring balance, contentment, and joy to my life. So how do you cultivate a spirit of gratitude? This might seem like an obvious first step, but think about it for a moment. How often do we take what we might think of as the “little things” for granted – a comfortable bed, perhaps, or access to fresh and clean water, plenty of food, and a warm and dry home – and forget just how very, very fortunate and blessed we are to have them? How often does an attitude of entitlement creep in, convincing us that these things are somehow our due? I know that I have at times been guilty as charged. Cultivate a spirit of gratitude… by counting all of your blessings, whatever they include. Practice gratitude in difficult times. I have found that it can be a challenge to practice gratitude when I’m in the midst of an undesirable or unsatisfying situation, but this is perhaps the most important time in which to do so. One example that always comes back to me is from a friend who, when going through a particularly difficult time financially and struggling to pay her utility bills, still cultivated a spirit of gratitude by reminding herself what those bills represented – warmth, light, contact with the outside world – and being thankful for having access to each of those things. When I heard her story it really resonated with me, and I try to remember this example when I’m struggling to live in a spirit of gratitude. 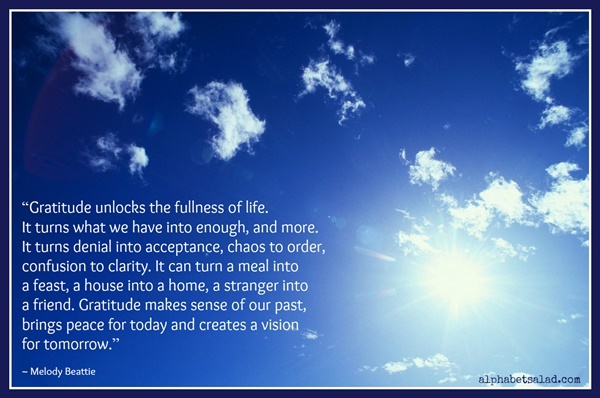 Cultivate a spirit of gratitude… by looking for the silver lining, a different viewpoint, the flip side of the coin. Be intentional – write it down! Whether it’s done on paper or a computer screen, a transformation takes place when thoughts, feelings, and ideas are made concrete by being translated into words. Write them down in your datebook or calendar at the end of each day. Send them in a letter to a friend. Turn them into a blog post. 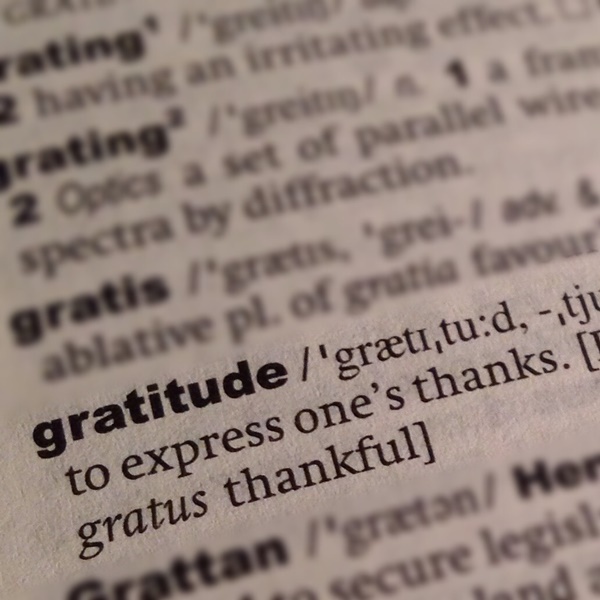 Cultivate a spirit of gratitude… by being intentional about putting your thoughts into writing. Make practicing gratitude a habit. Our everyday lives are peppered with habits that are part of our daily routine and have become a natural extension of who we are and how we choose to live our lives. Gratitude needs to become one of those habits. A few weeks ago I started a weekly tradition: every Sunday I would take some time to put item 3 into practice – write down a list of things for which I was grateful at that moment in time – then I would turn my list into a blog post and invite others to share their own gratitude lists, either as a comment or a link to a post. Very shortly after starting this practice of intentionally focusing on gratitude at a specific time each week, I noticed the attitude starting to spill over into the rest of the week. The more I practiced gratitude, the more I found it becoming a habit, with grateful thoughts naturally coming to mind in the midst of all sorts of situations, good and bad. Cultivate a spirit of gratitude… by making it a habit. Joy has a way of spreading when, as a natural extension of acknowledging and expressing gratitude for our blessings, we take things another step and extend part of those blessings to others. Grateful for being in a wonderful mood? Share it by spreading smiles and cheerfulness. Grateful for a well-stocked pantry and refrigerator? Share it by inviting someone over for a meal. Grateful for a special person in your life? Share it by letting them know how you feel. Grateful for your morning coffee? Share it by buying one for the next person in line. How do you cultivate a spirit of gratitude in your life? Please share! Your post is inspiring, you have presented it so well and in simple manner, I practice gratitude daily, before I go to bed, I recall and thank the almighty and all those things that has made a difference, also I am learning to make a habit for always being in a thankful state of mind… thanks Laurel and Corinne for sharing !! I started maintaining a gratitude book just this year. When I started it, I can recollect the beautiful things that have happened to me and on one of the awful days, I pick a page and read what made me happy, it cheers me up. I listed all that I could remember from last year and I was amazed at how the happy moments were far higher than the sad ones! Thank you for a very meaningful post, Laurel! Being worried or remorseful means we’ve allowed our minds to take up residence in either the future or the past. Purposefully practicing gratitude forces us to be in the now. Great post! Well, I am grateful for what I have, but I don’t particularly cultivate a spirit of gratitude (usually when I think about those things, I end up thinking about people who are unfortunate, and discussing why they are like that or why their condition isn’t already improving, given that we – as a species or as a society – have the ability to improve their lives). I suppose it is a good habit to develop. I do keep a journal, so developing a writing habit (about the things I am grateful for) won’t be much of a problem. Beautiful post and I too try and consciously practice gratitude…though don’t journal it often. I think a weekly habit is a great idea. Cicero’s quote quite sums it up as to what gratitude is for life. How do I practice it? I look around and see how many people are happy to see me happy. True story. It feels me with an immense sense of gratitude to realise that my life means so much to others. And in some cases like blogging to people who have never even met me. What else would a person need? Great post! Sometimes we’re so caught up in our various miseries, we forget to be grateful and that’s when it’s most important. Such a lovely post, Nice to meet you, Lauren! Being grateful during tough times is the real test! This is so inspiring and sounds like a recipe for a happy, content life. Sharing doubles your happiness. I used to write down my gratitude list at the end of every month in my blog before…. but when dark days started showing up I just felt like ignoring the good things too.